Finally think I’ve found my new shoes! So, here’s the whole, long D R A W N out story, if you want to hear it, starting way back in Fall 2010! See, I had my gait analyzed for the first time – foot measurements, treadmill camera, the whole nine yards – at Potomac River Running, back when we were living in Northern Virginia. I had a really friendly and helpful guy helping me, named Chris. He helped me find the Saucony Ride 3’s, which would be my go-to trainers for training and racing my first 8K, 1/2, 10-miler…then my next two halves and even my first marathon! Of course, I was mindful of his advice and was sure to replace shoes as the miles increased – which meant I had the pleasure of running in three pairs through my running career – my pink/silvers, blues and then white/red/aquas! This January, however, I knew I had to face the facts. My current pair of Rides, that I had trained with for Shamrock, would be surpassing the 400 mile mark around the time of the marathon, which meant throwing in a new pair would probably be a good idea. So, I went to the local running store (Ragged Mountain Running) and tried out the Ride 4’s. They felt…O K A Y. Not like the 3’s – but not terrible – but definitely longer. I took home a pair in half size smaller than usual. I ran a few treadmill miles with those and it just didn’t feel right. My foot moved around, hip (!) felt weird – which was definitely not normal for me – and it just wasn’t the same. So, back to the store I went. 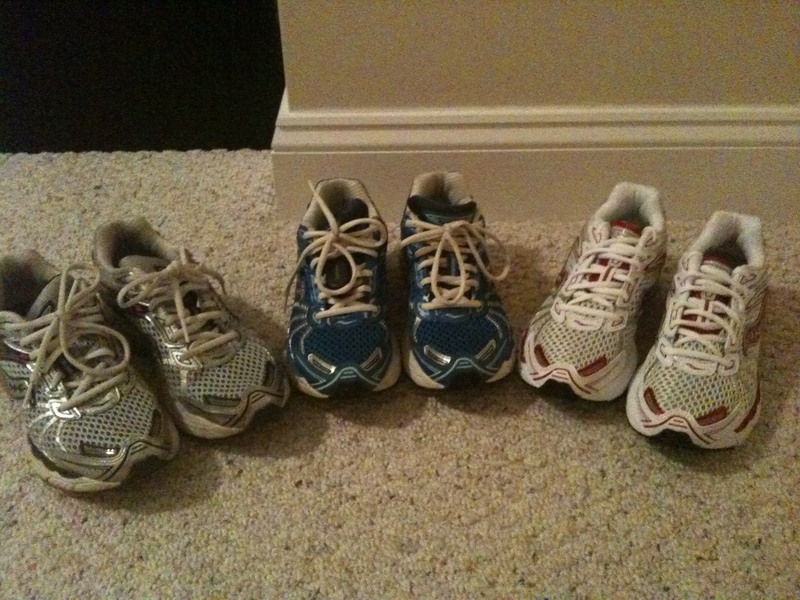 That visit, I was fitted in two other pairs of shoes – the Asics GEL-Cumulus 13 and the Brooks Defyance 5. The Asics (for me!) were wayyyy too cushy feeling – marshmallow-y, even. So, on went the Brooks – felt pretty good. Lightweight, I ran around the store, around the block…pretty good! Used the store credit from the returned Saucony pair and headed out. For the next month, I threw the Brooks on for shorter runs (3-4 miles) and while they felt pretty good, they did feel kinda stiff. I read their online review and saw that that was a common issue, but they could be broken in to a certain amount….great! So I kept on, keepin’ on. Finally, this week….it dawned on me, during my rest (I haven’t run since SUNDAY! AHHH!) this simple fact: I didn’t LOVE those Brooks. They felt narrow. They made a weird sound when they brushed something (crinkly) and (this is just kinda shallow but) they were NOT cute. AT ALL. Some blue Nikes (forgot the name, wasn’t a fan, I had been fitted in these before), Adidas Supernova Glide 4, Saucony Triumph 9. For these, the Nikes felt weird under the arch, the Adidas were so super too soft and kinda loose-feeling and while the Triumphs felt pretty good, they too felt overly soft…and they’re also $130. So, finally, I tried the Mizuno Wave Riders. They were the last ones, but the second I slipped them on, I knew they felt the best. I did the walk, jog thing around the store and really enjoyed the feel – the only thing was, as hubs had been patiently waiting through this process, he was cringing a bit. So, I went with the 15’s – and ordered the color combo seen at the top of the post (Lemon/Dark Shadow/Aqua, if you were curious) and will receive them in store in 5 to 7 business days. I am very excited about my new direction for running shoes (har har) and am amped to start a new cycle of training for the next race! In the meantime, I will be treadmilling with my go-to indoor running shoes (Saucony Shadow Genesis – I have these in ORANGE) and eeking out the last bit of wear from my Rides for outdoor runs. Hope you love them! They look awesome.. love the colors. 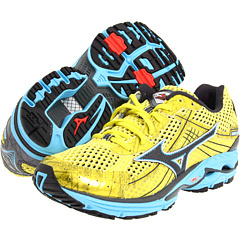 I’ve actually never tried Mizunos, and i like the colors! 🙂 I always used to run in my Nike Structure’s but lately I’ve been doing my mileage in the Brooks Pure Cadence. I love them! Haven’t done crazy miles in them though but so far so good! Hahahaha. We are ALMOST shoe twins. I started exclusively in the ProGrid Guide. I added the Shadow Genesis for shorter/indoor runs (and I’ve NEVER seen someone else who wears these!!). I recently decided I wanted to try a new long run shoe, and tried on a bunch, and ended up with the Brooks Ghost. And they were okay. But I didn’t love them. Brought them back last night, and ended up with the Triumph. They are WAY more expensive than I would have ever imagined spending, but hopefully they’ll hold up to marathon training. I seriously LOVE the Shadow Genesis. I don’t know how more people aren’t in this shoe. I accidentally wore it for a longer-than-intended outdoor run last week, and had zero problems. I wouldn’t do that regularly, but… good to know, I guess?! Love the colors! I love my Asics Kayanos! They came out with an 18 and not sure if I will love them (I sure as heck don’t love the $130 price tag), but I can always buy the cheaper 17s. I personally think it’s important to run in cute shoes–we need all the motivation we can get right? Definitely, shoes that you love build confidence! Those look like great shoes! I love my Saucony Mirage these days, and the green ones were perfect for Shamrock. Yay for finding a winner! I haven’t tried Mizunos before but everyone seems to love them. I’m rockin’ the Saucony Mirages too – and it sounds like I have the same obnoxiously green ones that David does! Nice! 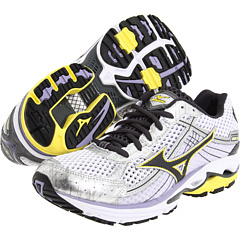 I will definitely report on the Mizunos…. my favorite running shoes so far were 2 or 3 pairs ago, depending on how you count. they were Adidas, specialized for trail running. but they fit me SO well and were crazy comfy! i wore them for whatever jogging i did (which wasn’t all that much until 2 years ago when i started the couch to 5k with friends). those were wearing completely through the tread (because i don’t buy new as often as i should), so i bought a pair of the “updated” version of the same thing. the “updated” trail shoes were supported oddly and didn’t match my gait well at all. i ended up not using them for running, only for ‘running’ errands.